Well, it's day two of my blogversary or my birthblogday or my birthblogversaryday . . . err . . . blogbirthaversary day. Yikes, by the end of this week maybe I'll settle on a title! So now I've technically kept up my blog for a year and a day! Woo hoo! Have you checked out and entered the first celebration/thank-you/I-did-it giveaway? (Apparently, I have a real difficulty settling on simple names for things.) If not, go to this post to enter to win a set of rosette ribbon bookmarks from Belle Rose Designs. Today's giveaway is sponsored by a dear blogging friend . . . one you probably know because her creations are EVERYWHERE! Bev, from Flamingo Toes and Flamingo Toes Designs is a creative genius . . . and she is also super duper generous because today she is giving away a $25.00 shop credit to her store Flamingo Toes Designs. I'm not sure how to even start picking my favs from her shop, so I'm just throwing some pictures up here for you to oooooh and aaaaaah over. ~Well, this is my birthblogversaryday (oh that has a nice ring to it), so be or become a follower. I'm a follower, of course! Happy birthblogaverysaryday. I'm going to be making scrabble tile artwork for my siblings' homes. I thought I'd like that birdie towel, but since you brought that necklace to my attention I'm going to have to change my answer! 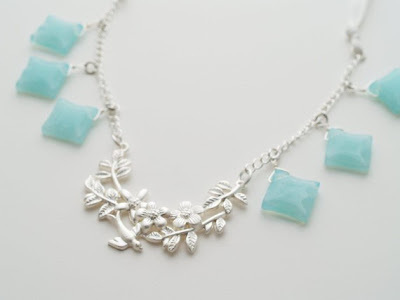 I love silver jewelry with that color blue accents! hmm, gift for someone. I have a tshirt quilt I started six years ago that isn't finished. It's for my husband. I'd like to FINALLY finish that! I'm liking the birdies in love towel. It'd be a perfect wedding shower gift for one of my sisters! I am a follower! :) Happy birthblogaverysaryday! What a great give-a-way!!! 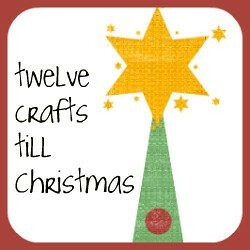 I plan on making my gifts for Christmas in advance this year to avoid all that stress! lol I need osme good ideas... but for now, I am planning on making some fingerless gloves for a friend up north! That bicycle necklace is so me!! I would definately pick that one!!! WOW!!! I would love to win this giveaway! She has great taste! I want to make a jumper for my daughter this winter. I hope. I might be able to do it...I have the fabric...and the pattern. Now I need the time. OH MY!!! I LOVE the bookmarks with leaves. I would want one for me and maybe a friend. I also love the aqua drops necklace. That is how I would spend my $25+! I got a sewing machine for Christmas and one of my boyfriend's good friends is having a baby this year, so I'm thinking the new little one will be getting a cute blanket or something. I'm loving the seaside pearl earrings. I've facebooked about this giveaway! I've tweeted about this giveaway! YAY!!! I love Bev and all of the goodies in her shop! I'm planning on making some super cutie t-shirts for my kiddo and his daycare buddies for Valentine's Day. 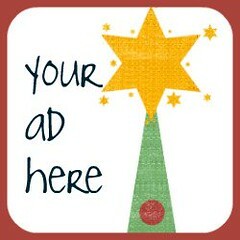 I follow Bev @ FT! I love the Birds in Love dishtowel. So cute! It is my goal to finally make my daughter her quilt this year. Hopefully for her birthday in July, but if that doesn't work, I can still gift it to her for Christmas. oooh, I like the Seaside Pearl Earrings! I love all of Bev's things. I would probably use the money on a necklace. I want to learn how to crochet this year so I can make hats and those cute little flowers. I would really like to make a pillow buddy for both my kids. I am so happy to be a follower of this blog! I would really like to make the Flat Iron Cozy for someone's birthday this year! I follow Bev @ Flamingo Toes! 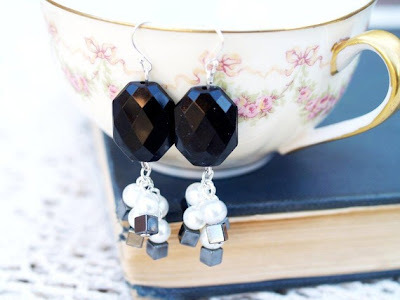 I visited her shop and really like:Pink and Brown Floral Ribbon Bookmark, Aqua Drops Necklace, Gray and White Flower Ring, or these Shades of Blue Crystal Beaded Earrings. Just became a follower of your blog. LOVE it! 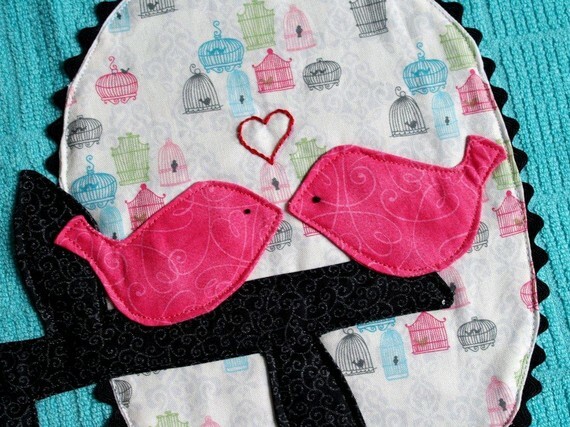 I just adore the birdies in love dishtowel! 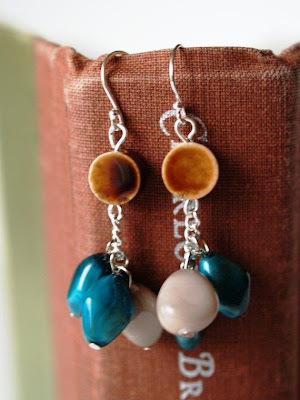 As for jewelry, the Shades of Blue Crystal Beaded Earrings are lovely. I really love the little Rebecca shoulder bags and also those adorable little rings. I'd like to make Valentine's Day cards with seeds for planting flowers. Doesn't that sound like fun?? I'd spend my $25 on the Field of Flowers Necklace!! Lovely! I'm going to be making doll accessories for my daughter and niece! I've been a follower, happy blogversary! One thing I look forward to making this year is a cute mobile for cousin's baby, expected in the first week of February. I would love to get one of Bev's anthro knock-off necklaces. I love all of her Anthro knock offs, so would choose a necklace.. I'm making my mom a towel holder to take to water aerobics! The bicycle necklace is so cool! Just became a follower~ Happy anniversary to your blog! I would use the gift card on the Aqua Drops Necklace!!! I'm a new follower Came here from Bev's blog! Happy Bloggiversary!! I would like to make some flower pins for my mom, sister, and all my close friends. I would definitely spend my money on the new Antique Bicycle Necklace or the Rosette Ring! Both are unique and gorgeous!!! found your blog via flamingo toes blog...I'm now a follower! Happy Blogoversary! Any friend of Bev's is a friend of mine! Following, of course! This year I'm hoping to make lots of hand-made gifts, and am looking forward to tackling the medium of silkscreening. I'm pretty smitten with that Antique Gold Bicycle necklace! I think I'd have to purchase that Antique bicycle necklace! I follow Flamingo Toes and happy Blogaversary! I love following Flamingo Toes! I really want to make your little kitchen set for my kiddo. Apron and all! I would probably get the bicycle necklace with my gift card. I want to learn how to knit or crochet this year and make people some awesome scarves or hand warmers for Christmas! I visited the store(not for the first time,hahaha)and have quite set my heart on the gray and white flower ring. IT'S SO CUTE!!!!!!! I've been checking out your blog for a while now and I just become a follower. I love all the crafts you share. I'm also a follower of Flamingo Toes. Bev's blog is a fave! I'm working on a weekender for my Mom for her birthday in March. I'm planning on some other bags for gifts this year too! I love the Pink and Gray Rosette Ring. I also like her Rebecca bag pattern! 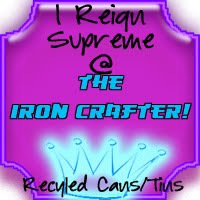 I am a follower of Twelve Crafts via email subscription. This year I want to make my husband a quilt with the secret fabrics I just ordered online. I want NO chance of him finding out so I won't say what they are anywhere but he will love it. What I think I might buy if I won the gift cert to Flamingo Toes would be either the Aqua drops necklace or the rebecca Shoulder Bag pattern. Of course, there are tons of things she makes that are just as awesome so who knows for sure what I'd finally settle on. You've definitely got me ooh and aahing! Happy blogbirthaversery! I'm a follower! I want to make unique names plaques for my family members this year! I'm a follower! Happy Blogaversary! Ooohhh, jewelry. Well, I'm already a follower, but would sign up just to win anyway!! Thanks! Well, so far I have some photo puzzle cubes to make the kids and an interchangable holiday block decor set for a friend. I'm now following Flamingo Toes. I love the black and white swirled bead earrings and then I'd throw in an extra dollar so I could snag the Rebecca Shoulder Bag Pattern...super cute!! I am a new but faithful follower! I also follower Flamingo Toes! I totally LOVE the old time bicycle necklace. My daughter would love it! I just posted about your giveaway on facebook! Great giveaway! Congrats! I want to make something sewn for anyone in my family! I follow Flamingo Toes already! I've said it before and will say it again! The Birdies in Love Dishtowel is my favorite! I'm a follower and I LOVE Flamingo Toes! As for a gift I would like to make this year..a dollhouse for my niece! Oh man it's hard to choose...I would probably get the shades of blue hoop earrings or the Fields of Flower necklace! I love the brown and teal drop earrings...Gorgeous! I love the birdie towel - that is just too sweet!! oh and first of all i'm a follower of yours. lastly i would buy a velvet bling bookmark, the sweing scissors bookmark (i'm a librarian in training) and the rebecca shoulder bag pattern that i've been coveting. happy blogoversery and thanks for the giveaway!! I would get some of those blue and white earrings. I <3 earrings! I will mention this giveaway in my blog post. However, I'm only allowed to publish one post a week, so the post mentioning this will be out on Saturday. Check on Photographer at Heart then! I love her Seaside Pearl Earrings! I would try to make the pillow pet project you posted. I would def like to win this giveaway. I would get the Field of Flowers Necklace. So cute! I love her blue crystal earrings. So pretty! i would buy one of her adorable rings! I'm a new follower! Nice to meet you! I already follow Flamingo Toes! The pink beaded drop earrings are super cute! I would like to make my friends some rosette pins. Oh, and obviously I follow Bev @ Flamingo Toes, hehe! i would pick the shades of blue hoop earrings! I am a follower! You Rock! This year, I would like to make some baby decorations for my sister, who is going to have a baby!!! I love to read, and the Sewing Scissors Bookmark caught my eye over at Flamingo Toes - but you are right, there is so much to love!! I made a quiet book for my daughter last year. I would like to make another one that is easier for her to use. I am now a follower of her cute, cute blog. I would get the Aqua Drops necklace. I really need more pretty necklaces.